We're excited to be participating in the ABC's of Nature which is hosted by School Time Snippets. 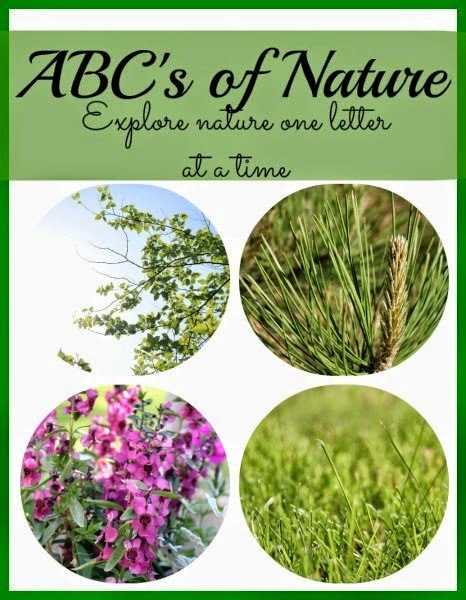 26 bloggers are sharing a nature themed post for each different letter of the alphabet. Already so many amazing nature activities and resources have been shared. We were lucky to have the letter M, as there were so many different nature themed ideas (mountain, moon, morning, mist . . .) But in the end we settled on "M is for Meadow." I've mentioned before that we're pretty blessed to live in an area where opportunities to engage with nature are just a step outside our door. For this exploration, we walked a little farther down the road to a large meadow. We talked a little about what a meadow is and what we might find there before we left the house. On our walk we made up our own words to "Over in the Meadow" which is a cute song that has been turned into several different book versions. My favorite version is illustrated by Ezra Jack Keats. As soon as we got there we started noticing some of the items on our Scavenger Hunt page. Big Brother quickly started crossing them off. He's been looking for an opportunity to practice using his butterfly net (which we purchased at the dollar store) and this was a great time to try it out. In the end we saw almost everything on our list except for a snake, chipmunk, and caterpillar. We also saw a few things we had not included on our list: bumblebees, milkweed, and a deer bed. Everyone enjoyed getting out into the field and searching for specific creatures. Big Brother never did catch anything in his net, but he definitely had fun trying. Scavenger hunts are a great way to get kids looking at nature carefully by practicing using searching and observation skills. With clip art, you could also create scavenger hunts for other types of habitats, such as the forest, pond, beach, or swamp. We'd love to know, what natural areas are near you that you like to explore? Love the scavenger hunt you created! Great way to explore nature and all the unique plants and critters in that habitat!